Big data is changing the game, and if you aren’t using analytics to measure, qualify, and quantify your law firm marketing efforts you’re allowing other attorneys in your area of practice to grow their business in your place. Do you have the longest-tenured law firm in your city? Do you rely on name recognition from past marketing efforts or your reputation as experienced litigators to acquire new clients? This may be enough to maintain a profitable practice, but is good enough really good enough for you? If you and your legal firm want to accelerate client acquisition, retention, and grow your ongoing business with existing clients, then invest in data-driven marketing powered by cutting-edge analytics. Today’s analytics-based marketing insights are both profound and easily accessed (if you know where to look). You don’t have to learn everything there is to know about web marketing to grow your client list in 2018. There are reputable law firm marketing agencies (like ours) that can help you set up and successfully leverage website, social media, and email analytics to measure the success of marketing campaigns. Curious to learn how analytics can help you grow your legal brand? Read on! When you install Google Analytics, Kissmetrics, or similar free analytics code on your website, you’re able to collect useful data and generate reports on that data to understand how people arrive at your website, use your website, and how different pages on your website are performing. By analyzing the source of your website traffic you can quickly understand how potential clients are finding your law firm’s website. You’ll also be able to understand how users from each source tend to interact with your website, and what percentage of that traffic converts into a client lead. This will allow you to make smart marketing decisions for your law firm, investing your marketing budget to grow your online presence in the most effective channels. For example, you may have 600 new users visit your website via Facebook campaigns each month, and you might average 150 from paid Google search campaigns. If the cost of these campaigns is similar and 5 individuals from each campaign convert into paying clients, then you can make an informed decision to invest more of your marketing budget into growing web traffic from Google search. Having accurate analytics data which allows you to understand that 3.33% of your website visitors from Google vs. only 0.83% of your visitors from Facebook convert into a paying client is critical, and leveraging this analytics data will allow you to spend your client acquisition budget more effectively. Most analytics suites track website page views and average user time on site out of the box, allowing your law firm to quickly understand how your website is performing (and where you need to improve). If you learn that 90% of visitors to your homepage leave the site within 7 seconds, that’s a problem. This data makes it clear that your website design, brand messaging, and perhaps other factors are turning users off, or making them feel they should look elsewhere for legal representation as soon as they arrive on your site. Analyzing reports on which pages are most popular with your users, and which are performing poorly can help you understand what’s working and what isn’t working about your website, fixing issues before they cost you business. Additionally, your digital marketing account manager can also leverage remarketing campaigns, to show targeted advertisements to website visitors. For example if a website visitor viewed a page on your website about criminal law, your remarketing campaign may display an advertisement to him later that day showcasing your reputation as an excellent litigator in criminal law in an effort to get him or her to request a consultation. A proper analytics implementation on your law firm website will allow you to get granular, and understand the conversion rate and ROI of specific marketing campaigns. Over time, you can combine this marketing campaign conversion rate data to data points such as hours billed for each of those new clients, allowing you to evaluate marketing channel and campaign performance to choose the best legal marketing campaigns for your firm’s area of practice while maintaining a positive ROI (Return On Investment). The data collection and analytics game has changed business forever. 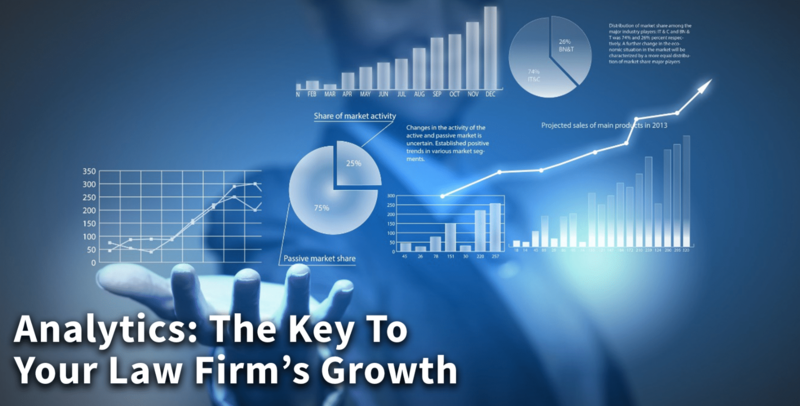 The days of broad-brush marketing and poorly understood ROI are fading fast, and savvy law firms of any size can open their doors to data-driven digital marketing by leveraging analytics.